Zalman bills itself as the "quiet cooling solution" and they have a reputation for easy to use, reliable products. They also have a reputation for creating products that look as good as they run. With the CNPS 7700 Cu, "bigger is better." A quiet, downward blowing 120mm ball bearing fan sits at the heart of a radial array of copper convection fins. While it works silently in its normal setting, its Silent Mode virtually eliminates all noise as well as vibration as it cools not only the CPU, but the RAM, VGA card, Northbridge and other components. The included FAN MATE controller lets you choose in which mode the fan operates. Heat is drawn away from the CPU by the pure copper base of the heatsink and it is transferred up into the twin semi-circular arrays of copper fins for dissipation. Both Intel Socket 775 and 478 Pentium 4 chips are supported by the 7700-Cu. It is also compatible with AMD 64 processors using 754, 939 and 940 sockets. Excellent Cooling Performance The ZALMAN CNPS7700-CU features a pure copper base and high-density fins, plus a powerful 120mm dual-ball bearing fan to deliver supreme cooling performance. Adjustable Fan Speed The ZALMAN CNPS7700-CU comes with a fan speed controller (Fan Mate 2) so you can fine tune the fan speeds for the optimum balance between cooling performance and noise level. Universal Socket Compatibility The ZALMAN CNPS7700-CU features broad compatibility with AMD socket 754, 939 and 940 platforms, as well as Intel socket 478 and LGA 775 platforms. Does not generate noise or vibration in Silent Mode. Pure Copper base material ensures excellent heat dissipation. The large 120mm fan inside the FHS maximizes cooling performance by providing sufficient airflow even at slow rotation speeds. The large 120mm fan provides air flow over a large area, cooling not only the CPU, but the VGA card, Northbridge, FET, and RAM. The adjustable fan speed controller (FAN MATE 2) enables control of noise and fan performance. Pros: For being an air cooling heat sink, this thing works great. my CPU temp on my old Pentium 4 2.4c Northwood went from 6-7 C above case temp to either case temp or a few degrees Celsius above or below. Load temps were the biggest improvement. Load on stock heat sink with arctic silver was about 15 C above case (50-54 C) and is now no more then 7 or 8 C above... astonishing. The instructions that it came with explained enough to install on my old Socket 478 board but I could see that install on some other boards (LGA 775) was a bit more elaborate. QUIET, it's like a whisper. but then again, i got a large case with 8 fans so this thing is like it isn't even there. Use some arctic silver 5 and this thing works awesome. The included paste seems a bit cheap. Cons: BIG, but is that really a con? The fan speed controller... Zalman, do you really expect someone to strap that thing on the side of their case? I just made a panel and mounted it in an empty CD-Rom bay. even then I don't use it as my motherboard seems to handle the speed of it fine. Other Thoughts: Perhaps Zalman should redesign the speed control so it could maybe fit in a CD-Rom bay, floppy bay, or as a slot in the back? Even better would be to leave it out of the kit and have the controller as a separate purchase. This way the user can choose the style of controller they need. Pros: At the time of this post I've been using this cooler for almost 5 years. The fan still works great and is quiet. I think this heat sink will out last the board at this rate. right now the CPU temp is fluctuating between 40 and 58C (~25C in the room) AC seems to drop the temp when its running. I've not had a thermal shutdown but the highest it get in my house is ~86F or 30 C.
Cons: heavy.. wide, and its over 2 lbs.. there are many heat pipe style coolers that are just as efficient (or more) but take up less space and weigh less. I'm still happy with my purchase. Other Thoughts: I've been running the same 3.6Ghz Prescott P4 (TDP of ~115W) for all this time. Other Thoughts: This is the second CPU fan I buy (similar model). I am still using the one I bought few years ago. Still works flawlessly. Make sure you check if this monster will fit into the case. Most modern cases are big enough though, except these all-in-one solutions. be careful with the fins. They are pretty sharp. Pros: Great Cooler. Zalman really know what they are doing. Its not as heavy as i thought it would be. My P5q Pro Turbo holds it well. COOLER MASTER Storm Sniper, helps alot. Keeps a 4.0 overclock stable. Pros: Durable: I've owned this cooler for four years. Not a whimper from the bearings. High thermal capacity: Much more than comparable weight aluminum coolers. Low noise: Easily the quietest component in my system. 7200 RPM HDs make far more noise than the fan. Comes with a rheostat if you find it necessary to further quiet the fan. Cons: Somewhat heavy: a danger when moving the case. A drop may break a mount off the motherboard. I've never had this problem however. Fins can be bent but this doesn't affect the performance of the cooler. Large computer case required due to clearance issues. Other Thoughts: I've owned both this cooler and it's smaller 90mm brother. The 90mm is still going after SIX YEARS of constant use on a P4, Q6600, and finally an LGA775 Celeron. Adapters have always been inexpensive and available for both the 120mm and the 90mm. Currently the 120mm is on the Q6600. I found the 90mm to be inadequate after jacking up the core clock to 3.0 GHz on the Q6600 but this merely my cautious nature by no means a requirement. The 120mm can have clearance issues in computer cases with power supplies or fans mounted on the top rear of the case. If it fits the fan blows air onto the northbridge heatsink and onto the caps surrounding the processor; an added bonus. The fins can be bent and are somewhat sharp. I've never cut myself but I have bent the fins that sit closest to the mount screws. The only affect has been cosmetic in nature. The weight of the cooler comes into play while handling the machine. Pros: Looks nice and well made. The large fan blows air over the memory. Cons: Very heavy and difficult to install on a 478 socket. The 'S' and 'L' brackets don't fit tightly putting uneven strain on the motherboard. The huge flower design leaves little room for error. Other Thoughts: My newly recapped and tested motherboard died. All the weight bent the board damaging the socket. It no longer posts and turns off in seconds - a total loss. Don't use this CPU cooler with a 478 socket, it is not compatible. 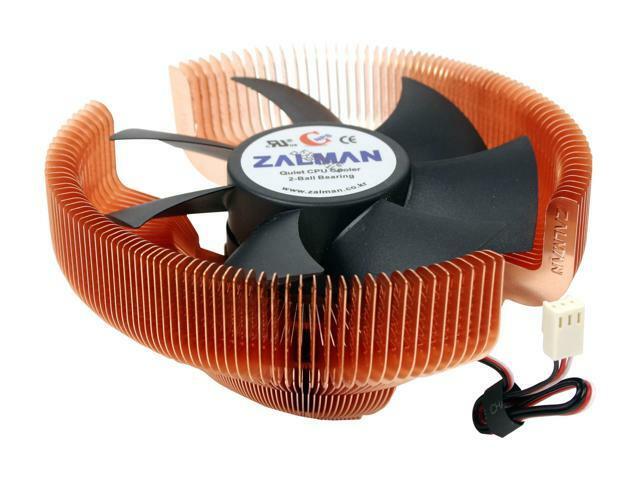 Zalman makes a lighter version with a 92mm fan that puts less stress on the motherboard. Pros: Setup with an Intel DG45FC mobo with dual 2.5" HDs configured RAID 0 on Silverman 2.5"-to-3.5" adapter. Installed SeaSonic ECO 300 300W SFX12V PSU. Non-modular, but small and with a little work, easily managed in terms of cabling. Cons: Taking it apart will be too much work: six screws on each side, four thumbscrews for the PSU, four for the mobo, minimal access for hands within case interior. Other Thoughts: Mini ITX boards are small. The challenge is finding a case that is too small for a practical buildout. This case is the best compromise and is high quality. Pros: Great cooling. Much better than stock Intel fan. Cons: Unfortunately, this fan produces more noise than I was expecting. It isn't coming from the spinning of the fan, it's a noise that is generated by the way the air passes over the uppermost/outermost portions of the cooper fins. It's a turbulent roaring sound, and the fact that the fins extend so far out and are unsupported at their extremities allows the fins to vibrate, resulting in an even greater sound of turbulence. The intensity of this sound is very noticeable when the fan is running at %100 speed. Fortunately, it cools my CPU well enough that the fan doesn't reach that speed (that is, once I properly set my BIOS fan controller). Now that I've witnessed the acoustic flaws in this type of flat-set, wide-finned design, I think I'll start buying the vertical-mount fans from this point on. The vertical coolers, with their tightly stacked rows of fins, shouldn't suffer from these vibration/noise problems. Other Thoughts: To install it, I had to take one of heatsink fins off of one side of a RAM module, but that's no big deal.